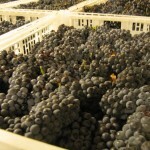 Our grapes from California arrived yesterday by refrigerated truck. 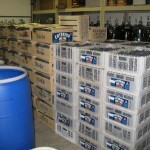 It took an hour to unload 120 crates of luscious red Merlot, Cabernet Sauvignon and Pinot Noir. I hired a professional winemaker (not that I’m not) to personally create the best wine you’ve ever had for under $100. The “crushing party” begins at 9:00 this Saturday, October 3, 2009. Pay $270 for a guaranteed 30 bottles of wine. You may join us at our “blending party” in several months to produce the ‘perfect wine’ – your wine.